Lunch for 4 for under $30? Yes please!! For those who don’t know, Dave and I are “Eastern People”. He’s from New York, and with the exception of 3 years or so in Hawaii when I was very young, I grew up on the Eastern Seaboard. We are accustomed to humidity, high populations, and rich colonial U.S. history around us. People from the western U.S. have their own set of traditions and nuances (calling “interstates” “freeways”, for example), and apparently In-N-Out Burger is one of them. There aren’t many of these restaurants, and they’re all concentrated in a 5-state area: California, Utah, Nevada, Arizona, and Texas (why they completely leapfrogged over New Mexico is beyond me). In-N-Out has no plans to expand beyond this small market, unlike Five Guys, which now has well over 1000 outlets. We had a chance to check it out! Numerous friends and colleagues Dave and I have met over the years from the western U.S. have regaled us with tales of In-N-Out’s simple menu, low prices, and unique flavors. To drive out to Promontory Point on our Utah trip, we took I-84/15 northward along the eastern shore of the Great Salt Lake. 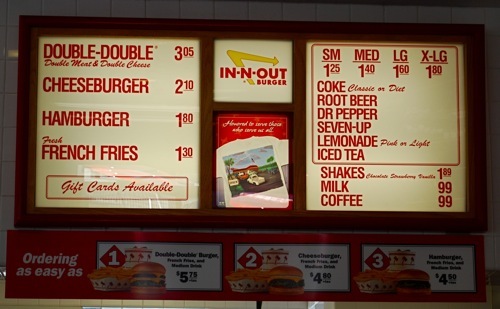 We saw a billboard advertising one the of nine In-N-Out burgers in the Salt Lake City area, Dave and I agreed that it’s something we should try…so we can say we tried it, at least. We explained to the boys that we were having burgers for lunch, and proceeded to the northernmost exit with an In-N-Out Burger, which was in Riverdale, Utah, just south of Ogden, home to Hill Air Force Base. It was barely 11am, so this was a pretty early lunch for the family. Very basic menu, more basic than Five Guys! We all got “Double-Doubles” (you only live once, right?) and orders of fries and drinks. The total bill was around $28. How was it? Frankly, we all like Five Guys better, and I’d even go so far as to day that I like Whataburger better…we had a Whataburger in our neighborhood in Navarre. It was similarly inexpensive and tasty. Jacob and I barely ate any of our fries, because the burgers were so filling. 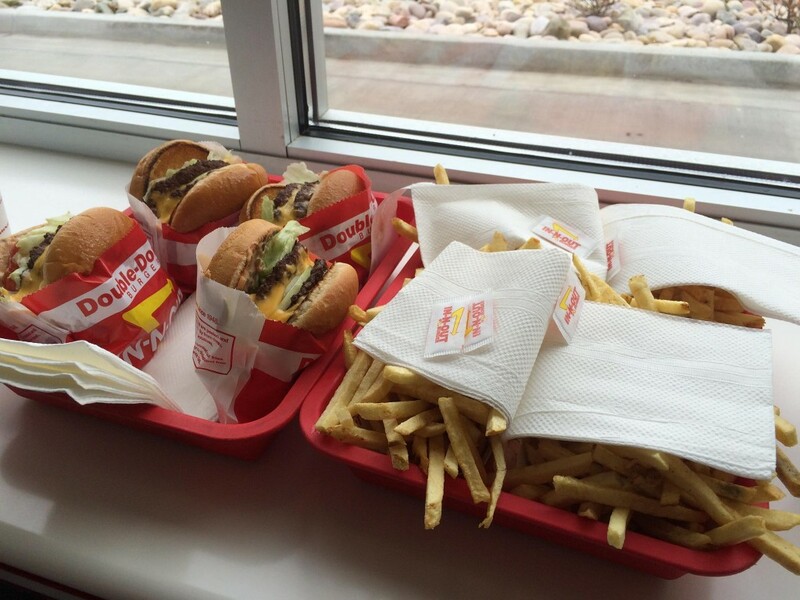 Being the social media girl that I am, I posted a picture of our lunch on Facebook not long after we ate, and friends who grew up in or spent time in the western states told us about the In-N-Out “Secret Menu“. It doesn’t add anything else really to the menu (for example, a Neapolitan shake is merely squirts of their existing three milkshake flavors into one cup), but you can simply order a burger “Animal Style” and the employees are supposed to know what that means. After this early lunch, we continued our journey to Promontory Point. Which shall be the next post in our Utah adventure.